Throughout my years as a dietitian working with people with eating and weight issues, it seems that a majority of people have a set “goal weight” in their heads. It is if there is some perfect number they need to reach, and then they will be happy with their bodies. Even parents of young children ask me “what should he weigh?” as if at 8 years old his body needs to be at the perfect weight (despite needing to grow a few feet by the time he is 18…), so does it really matter if his weight is “perfect” right now? Let me ask, do you really think our heads can determine what our physical bodies need to weigh? and is a body ever really stagnant, stable, the same day to day? No, it is not. And I have learned a few things throughout the years (research of course demonstrates that our bodies are all different and have a genetic “set-point” weight range) but watching what happens to people’s bodies has taught me more than books or research. 1. An individual’s weight NEVER stays at one number. 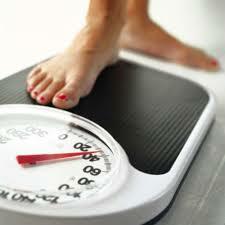 It is normal to fluctuate a few pounds up or down. 2. Goal weights are typically unrealistic. And when people manage to reach them, either they can’t stay there for long (and give up whatever rigid lifestyle they used to get there often going the other way to the extreme) or they live with having to constantly focus on eating (usually leading to an eating disorder or depression). 3. If and when people reach their “goal weight” they change it. Because their need is to focus on that number instead of the other scary and uncomfortable things in their lives. It serves a purpose (not a healthy one, but for some people, it distracts them and this is easier for awhile than addressing real issues). So what should you focus on if not your weight? How about looking at your lifestyle and deciding to make healthy changes you can live with! And giving your body what it deserves, healthy food, good sleep, fun movement, joy, and the permission to be what it was born to be…healthy AND happy! Many years ago one patient of mine said it best, and I will never forget: “It finally dawned on me. Why do I care about the force of gravity on my body?? ?” I wish you the same freedom!